Levine Museum has hosted hundreds of events, from weddings and rehearsal dinners to company meetings and holiday parties. With space to accommodate groups from 6 to 600, we have something that will fit your event needs. 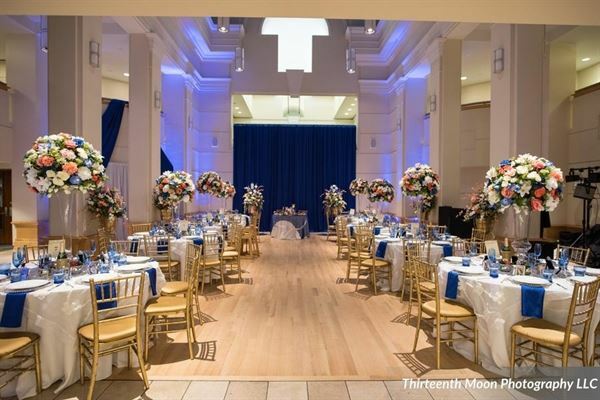 We would love to host your event here at the Museum! With each rental you will receive free entry into our award winning exhibits, free use of available tables and chairs, and complimentary parking for you and your guests on the weekends in the Seventh Street Station Parking Deck. Harris Hall: This is a flexible, multi-purpose room which can accommodate a variety of functions. It is ideal for lectures, seminars, training sessions and meals. Coupling Harris Hall with the Atrium allows space for dining as well as cocktails and dancing. $400 for up to three (3) hours $75 per hour for each additional hour. Turner: With half of the room walled with windows, the natural light in Turner is refreshing. This room is ideal for daytime lectures and meetings. Turner is also the perfect location for intimate dining events. The adjacent balcony allows for meal service. $200 up to three (3) hours $30 for each additional hour. Dowd: Spacious executive conference room is ideal for business meetings, seminars, board luncheons, and planning/training sessions. Grand marble executive table and comfortable chairs seat 20. The walls are equipped with tack boards and a hideaway marker board. A large pre-function area adjacent to the room allows for breaks and meal service. $200 up to 3 hours $30 for each additional hour. Special Features: Levine Museum of the New South is an interactive museum housing the nation's most comprehensive interpretation of post-Civil War Southern history.